Page from a journal handwritten by an unknown person, but likely by a descendant of William Ripley, that lists the deaths at Cornish, New Hampshire from 1826 to 1850. This post covers deaths in 1835. A Child of Albert Rich - 14 mo.. Died January 5, 1835, child of Albert Rich and Eliza (Hall) Rich, as mentioned on page 303 of History of the Town of Cornish, New Hampshire, with Genealogical Record, 1763-1910, Volume 2. February - the last entry for February, for a child of Francis Cobb, Jr., might belong under March. 12 - Mr. Levi Cate, 58. Born about 1777, son of James Cate and first wife Hannah (Ayers) Cate, as mentioned on pages 53 and 64 in History of the Town of Cornish, New Hampshire, with Genealogical Record, 1763-1910, Volume 2. 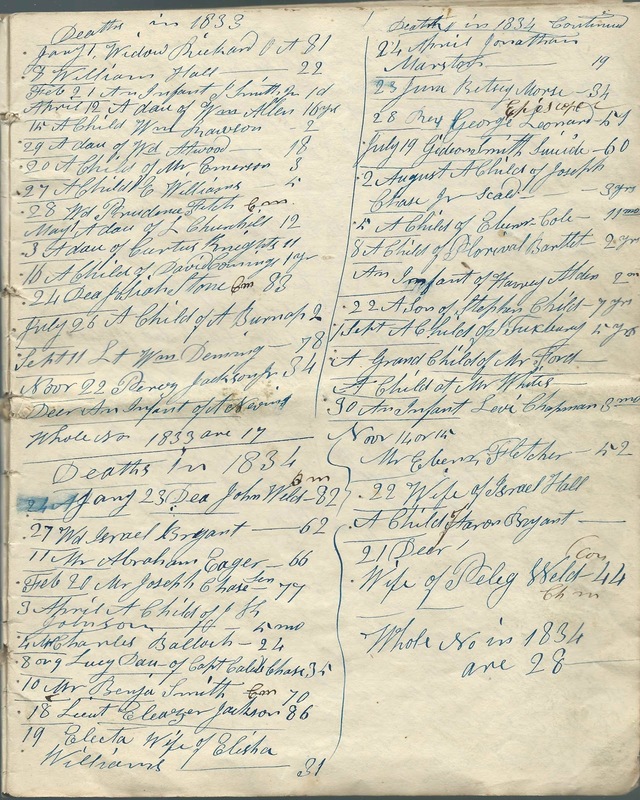 27 - Deacon Harvey Deming, Bm; mentioned as having died on February 26 on in a sketch on page 133 of History of the Town of Cornish, New Hampshire, with Genealogical Record, 1763-1910, Volume 2. 28 - A Child of Francis Cobb, Jr., - 15 mo. I wonder if this is the child mentioned as having died on March 10, 1835, child of Francis Cobb, Jr., and fourth wife Jedidah (Burnap) Cobb, in a sketch on Francis Cobb, Jr., on pages 92 and 93 in History of the Town of Cornish, New Hampshire, with Genealogical Record, 1763-1910, Volume 2. March - the last entry in February, for the child of Francis Cobb, Jr., might belong under March. An Infant at the Tavern House of I. Hall; presumably Israel Hall, a merchant, postmaster, hotel keeper, etc., as mentioned on pages 182 and 182 [with his likeness on page 182] in History of the Town of Cornish, New Hampshire, with Genealogical Record, 1763-1910. Whether the child was from Israel's immediate or extended family or from the family of a boarder, I don't know. 21 - Mr. Ebenezer Weld, 67. Historian of the Weld family, as mentioned on page 392 of History of the Town of Cornish, New Hampshire, with Genealogical Record, 1763-1910, Volume 2. Note: the FindaGrave memorial gives Ebenezer's death year as 1836, but all other records I've seen show 1835. 2 - A Child of Js. Carrol - 18 mo. The father was presumably Joseph Carroll or James Carroll. Presumably James Carrol who lost his wife the following month. Wife of James Carrol - Con. Possibly the Js. Carrol who lost a child the previous month. 29 - Mr. Jonathan Wyman, 64; mentioned as dying at age 70 in his sketch on page 433 and 434 of History of the Town of Cornish, New Hampshire, with Genealogical Record, 1763-1910, Volume 2. His Find a Grave memorial notes that he died April 29, 1835 but with the two prior sources, I believe September is more likely. Widow Perry, Wife of Capt. David Perry, deceased - 90. Anna (Bliss) Perry, born in 1740; her Find a Grave memorial notes that she died September 12, 1835 at Cornish, where some of her children and grandchildren were then living. Old Mr. David Lesslie. David Leslie; mentioned on page 257 of History of the Town of Cornish, New Hampshire, with Genealogical Record, 1763-1910, Volume 2. 21 - Ebenezer Huggins, Jr.; mentioned on page 212 of History of the Town of Cornish, New Hampshire, with Genealogical Record, 1763-1910, Volume 2. Both the book and his gravestone give his death date as October 22, 1835. 25 - Leonard, a Child of Joseph K. Johnson - 4 yrs. Leonard Johnson, son of Joseph K. Johnson and Louisa (Chase) Johnson; as mentioned on page 234 of History of the Town of Cornish, New Hampshire, with Genealogical Record, 1763-1910, Volume 2. 18 - Wife of Mr. Joseph Smith - Cm 80. Jerusha (?) Smith, mentioned on page 327 of History of the Town of Cornish, New Hampshire, with Genealogical Record, 1763-1910, Volume 2. 22 - Marshal, Son of Otis Jackson. Marshall Jackson, son of Otis Jackson and Catherine (Morse) Jackson; mentioned on 228 of History of the Town of Cornish, New Hampshire, with Genealogical Record, 1763-1910, Volume 2. 23 - Mrs. Bradley, Wife of Mr. Isaiah Bradley - 71. Mary (Dustin) Bradley, born about 1764; as mentioned on pages 31 and 32 of History of the Town of Cornish, New Hampshire, with Genealogical Record, 1763-1910, Volume 2. 26 - Widow Mercy Child - 82. Mercy (Chase) Child, daughter of Dudley Chase and Alice (Corbett) Chase and widow of Stephen Child, as mentioned on pages 84 and 85 of History of the Town of Cornish, New Hampshire, with Genealogical Record, 1763-1910, Volume 2.